The goal- get them before they go to seed. Plenty of nectar for bees, deep roots that accumulate nutrients, salad greens for the adventurous. What's not to love? 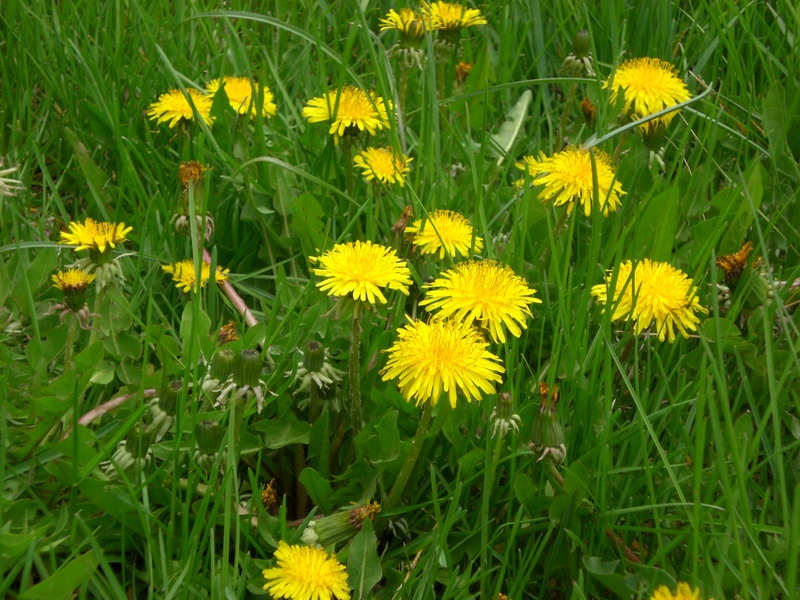 It does not fail- whenever my mom comes to visit, she comments that there is an excellent product called weed and feed, and it kills all the weeds, and fertilizes, too, and there’s even a generic version, if I think the name-brand is too expensive. She doesn’t have any dandelions, though. We’ve got enough for everyone. Since I won’t use poison, I have to work on weeds the old fashioned way- with a paring knife, or sometimes a digger, or sometimes just bare hands. I have filled buckets this spring- they go into the compost pile, with a layer of dead leaves on top, and a scoop of soil. I am not sure if my compost gets hot enough to kill dandelion seeds- I haven’t been too scientific about it. This year, for the first time, the kids have helped. I demonstrated how to lever the plants up at the crown, and offered to pay a dollar per bucket. It worked for a while- although I did see the boy blowing the seed heads off one that we missed. I don’t know what he wished for. More dandelions, I guess. I realize that just popping them up out of the ground doesn’t get rid of them- they’re perennial, they have deep roots, they’ll keep coming back. But after May, they aren’t so bad- no yellow flowers bringing down property values, just green leaves. They aren’t prickly like thistle, or annoying like bindweed, or crazy making like mallow ( my least favorite weed) they’re just green. Edited to add: My mom is really quite wonderful. Aside from a blindspot to herbicides, she is super smart, nice and caring. She also has dial up internet, so it’s possible she will never read this. Also, I noticed today that some dandelions in the front yard have gone to seed. Curses!